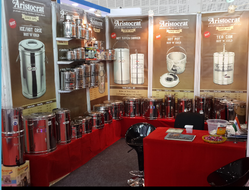 Established in 1990, Aristocrat (A Brand Of T M Metalware) are the Manufacturer and Supplier of Tea Container, Stainless Steel Milk Can, Stainless Steel Hot Tiffin, Electric Idli Maker, etc. Our catered product range raises the bar on both quality and function, as these utensils are crafted out of high-grade raw material to serve the promise of longevity and durability. We take pride in providing our estimable clients with the superior quality of products since our inception. Our team members always stay engaged in delivering qualitative goods in the market. They all are well versed in their respective domains. We have a good market reputation because of our efficient team members. Our quality checking team properly check each and individual piece of every assignment. They build a trustworthy relation with the company and our clients. They are very energetic and perform in the same way in the company. Our entire product ranges are highly efficient and highly reliable. They are sturdy in construction and manufactured from high quality of goods. They have the supreme strength and are excellently finished. We constantly make innovation with our products and productive technology. We offer attractive designs in our product range. They are light in weight and require low maintenance. Our products are available in various sizes and we offer market leading prices for them. Mr. Mahipal Jain is a proud Manager of Aristocrat (A Brand of TM Metalware). He actively takes participation in different tasks of the company and successfully handles our clients with his great efficiency. He knows how to please clients and employees of the company which in turn motivates them to give their full dedication towards the company. He has good decision-making skills and strong adaptability to switch in between different tasks without creating any chaos or nuisance. 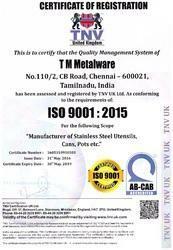 Manufacturing of Stainless Steel Utensils. In the present time, innovation becomes a very important part of success and our team constantly makes innovation in our product range. Because of them we receive positive feedback from the market. They work as per our guideline and maintain the dignity of our company. They are essential part of the company as any organization is incomplete without its team members. We have got support of our infrastructure in our achievement. As time move, our achievements are reaching heights along with our infrastructure. Presently, as we are in different domain, we have built our infrastructure according to it. It looks very impressive. It is spread over a large area with separate and different departments, where different processes takes place without creating any type of overlapping. We have a strong confidence in designing our product range and provide them in exclusive and superior quality in the market. Our main goal is to achieve customer satisfaction and we can go beyond to meet their desires. Our products are widely demanded in the market because of their sustaining nature. They are quality tested in different parameters. They are dimensionally accurate and anti corrosive in nature. They are stain proof and virgin metal is used to manufacture them.